Although we were expecting snow today, it was not to happen until the afternoon so I grabbed Maurice and headed into 2014 full of hope. I went to the same school I went to last year on my first hunt of 2013. The school campus is so large that there had to be a keeper or two left. I spent two hours at the school and I left as I did last year feeling that I haven’t yet even scratched the surface. By the way, I found 10 nickels. Once again, the plans of Deus and Man went awry. I had decided to take my XP Deus metal detector to a hunt with Stevouke for lunch but I had to take my lunch earlier than I had planned. I went to a lot where a house stood recently. Somebody had beaten me to it. There were fresh holes and a number of dug items left on site. I still pulled 4 memorials and a clad dime that they missed. These are my first silver wings. Other hunters in the area have found silver wings and now it was my turn. They are large and heavy. I did nick them a little bit but for the most part they are in good shape. I couldn’t get a good picture of the markings but it says Sterling on the back. Not that I needed to see the marking to know I had silver! This is the 5th piece of silver I have recovered since I learned how to interpret this one particular signal on the Deus. I began studying this signal when me and lawdog1 from the Friendly Metal Detecting Forum went hunting together. He had asked me to check a signal with my Deus and I dismissed the signal as iron. The target turned out to be a wheat cent and I turned out to be a dunce. Since that day however, I started to listen more closely to this particular signal. It is a composite signal with a sweet element to it. What I’ve done is to learn to isolate the sweet element and investigate further regardless of the VDI I get. In the case of the wings, an additional note is that they were standing upright and so I was hitting only the tip of one of the wings. I wished I had taken a picture of them in the hole but in the excitement, I didn’t think of it. And there you have it. I sure hope this streaks holds until at least tomorrow when I hunt an old church site with Steveouke. So last night, Steveouke once again graciously invited me to hunt what seemed like the perfect spot to find very old coins. The house on the property was built in the 1870’s and there was a stone barn where a church held gatherings in the old days. 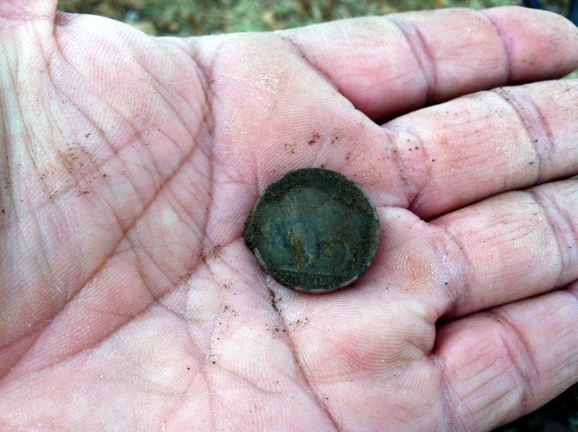 With visions of Seated coins dancing in our heads we tackled the site but after a couple of hours of hard detecting, none of us had anything to show for our efforts. So this morning, after breakfast and some family time and with an eye to redeem myself for last night, I bid goodbye to the family and headed out into the very cold morning. I began at a school next to a park. The school was built in the early 50’s so it held the promise of silver Roosevelt dimes and maybe even some late Mercuries. I found a couple of wheats (’44 and ’56) and then I got a sweet signal at about 3 inches deep. The VDI screamed dime and after I chiseled through the 3 inches, the beautiful sight of a silver coin’s rim appeared to my delight. I gave the school a few more minutes and managed to extract a 1910 wheat and a 1940 wheat before I decided that the ground was too hard. So I moved on to the park. 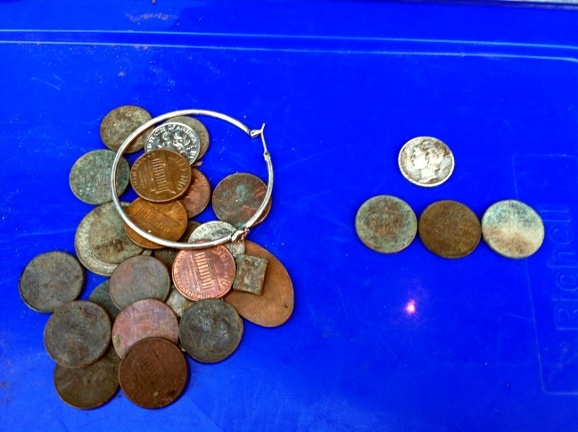 I decided to re-grid an area that gave up 6 silver coins last year and after about 30 minutes, I had 3 more wheats in my pocket. 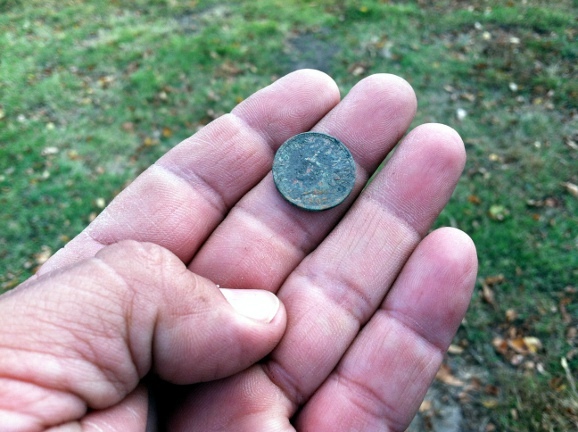 I then began walking randomly at a different spot that I had not hunted before and I found a 1939 wheat. Next I hit on a 1929 wheat. This was getting interesting! Then I got a quarter signal that sounded like trash. I decided to investigate because the Deus was telling me the target was 7 to 8 inches deep. The first thing out of the hole was a huge rusted nail. Sometimes, very rusted iron gives quarter signals. However, out of habit, I put the pinpointer in the hole and I got another hit. 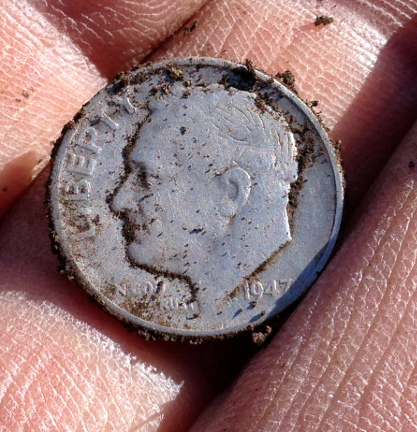 One more scoopful of dirt revealed the silver edge of a 1942 S nickel! Score! I stood up and I walked maybe ten steps when I got another quarter signal. I dug it up and the first thing out of the whole was a piece of unidentified rusty iron. No way! I put the pinpointer in the hole and nothing. I covered the hole and before I moved, I ran the Deus over the spot again and I got a surface dime signal! Sure enough, I had pulled a 1964 Rosie along with the nail but I didn’t notice. 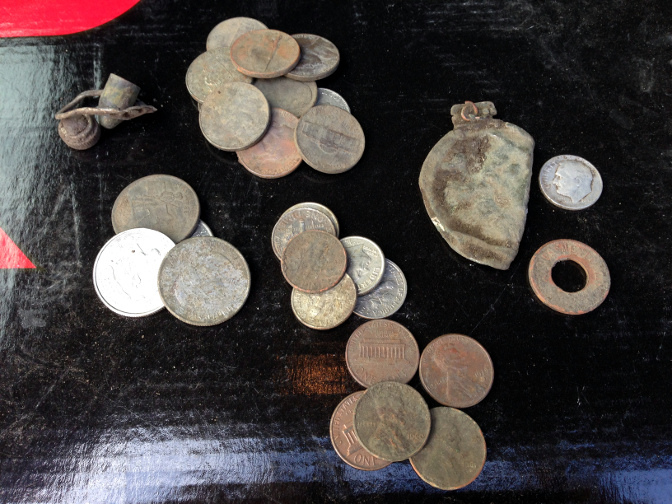 So I ended the 4 hour hunt with 3 silvers, 10 wheats, 7 clad quarters, 3 clad dimes and an assortment of copper Lincolns. …skip a site because you’ve heard it has been hunted out. This year, while hunting a postage stamp-sized park from the late 1800’s with some friends, I found a gold bracelet that at 10K –the bracelet was unmarked, will bring around $400 U.S. once melted. The park is notorious for not yielding anything anymore and yet, there it was, under the coil of my XP Deus metal detector. 1) People continue to use a site, even empty lots, and thus the site is replenished with new drops. 2) People who have hunted the place may not have been at the top of their game and thus missed lots of stuff. 3) Considering that a typical target takes up about a square inch of space, well, you do the math. Plus, there is another mystery to consider here. I don’t know why, and I doubt anyone else knows either, there are many targets that will only be detected at a very specific angle. I had read about this phenomenon from day one but I experienced it first hand well into my first year of detecting. I had hit a private yard from two directions perpendicular to each other (90 degrees) and had returned to do a diagonal search. Going over a spot I had gone over twice in the previous hunts, I got a sweet signal on the AT Pro (my machine at the time) and a VDI that said quarter. I couldn’t believe that I had missed this before. So I decided to go around the target and run my coil over it from different directions. To say that I was shocked is an understatement. I only had to deviate about 15 degrees before I lost the signal completely. COMPLETELY! Not a peep. Not a grunt, whisper, moan. Nothing. Unless I hit the target from that very narrow angle. 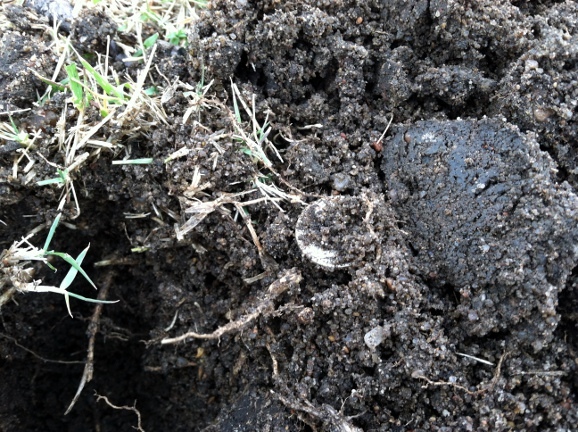 I dug the hole and at about 4 inches or so, if memory serves me right, I pulled a dateless Standing Liberty quarter. So lets now think about the fact that a typical target will occupy about 1 square inch of space. Even in a small park, or lot, or yard, we will have a sizable number of square inches to contend with. Add that to the fact that the majority of hunters don’t grid as carefully as they should, or if they do, they eventually tire and get careless, and now you’re beginning to see why there are still good targets left everywhere. Now, remember those targets that will only sound off at a very specific angle and my point is made. Last, I want to mention something Tom Dankowski says (Tom is a legend of this hobby). “80% of all dropped coins ever, are still in the ground”. He says this because there are several factors making these coins undetectable, the main one being masking. Another one is depth. 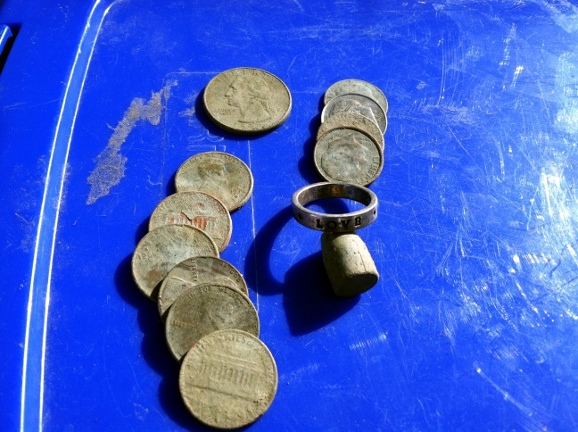 Tom says that these coins will yield only to the very experienced hunters or to metal detectors of the future. So there. Don’t be discouraged, the stuff is there. Go get it. After all the food was eaten and people set out to visit with each other, I quietly slipped away, grabbed my XP Deus metal detector, and set out to explore the High School at the town where the Thanksgiving celebrations were being held. The High School was built in 1916 so, even though I know that the local metal detectorist is legendary, I had hopes he missed a coin or two. 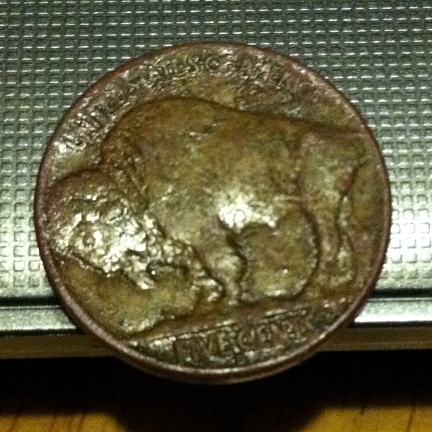 Right away, the second coin I dug was this beautiful 1936 Buffalo nickel. The signal was strong and the depth was 5 inches. Ah, I love these nickels! After almost two hours, it was time to rejoin the family at the T-giving fiesta. 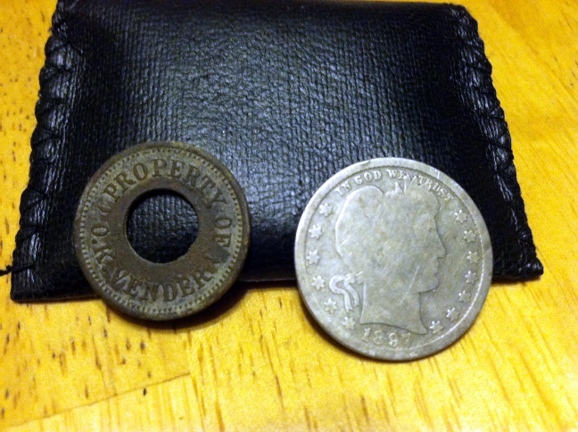 I managed about 2 dollars in clad as well but no other old coins. I sure would like to spend a day detecting around this school. One of the locals told me that near the present garbage dump at this town, there lies a forgotten park that was in vogue in the late 1800’s. The park is now nothing more than an overgrown empty lot and that a couple of decades ago, a local hunter found gold coins there. I need to research this! Yesterday, we had temps in the high 60’s with sunny skies. I didn’t metal detect. Today, the thermometer read 34 degrees, cloudy and windy so of course I grabbed Maurice and headed out. In truth, I wanted to test some new thermal underwear. I had a spot next to a school I’ve been wanting to try for a while. When I got there, I put my XP Deus metal detector to work. 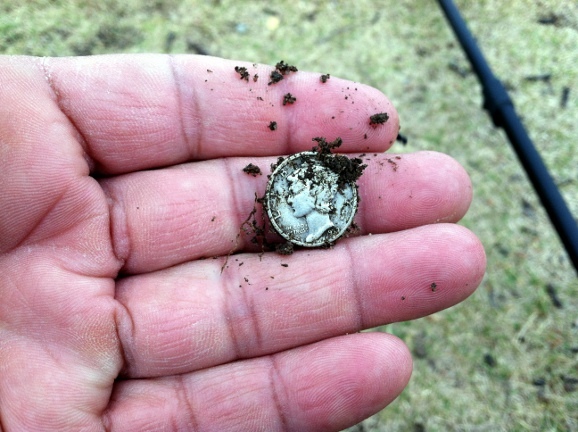 As luck would have it, the very first, digable coin signal turned out to be a nice 1939 Mercury dime at about 6 inches deep. It sure makes you think you will be digging silver dimes all day when your first signal is a Merc. The field where I found this Merc is fairly large and I knew I would only be able to cover but a small portion of it. I sure hope there is more silver there. At the end of the hunt, I ended with 3 wheats, some clad, and of course, the Merc. Not bad for a cold and windy day. Oh and the thermal underwear performed well. I returned to the 100 year old school today with my XP Deus metal detector. 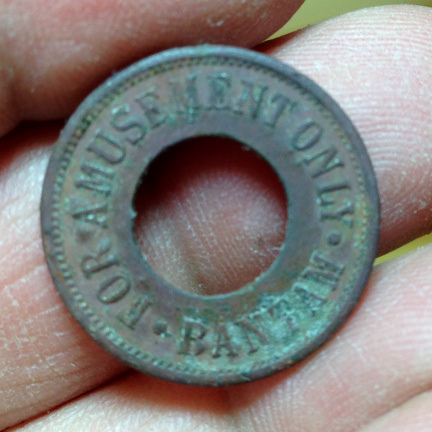 I was met there by Silversmith45 from the Friendly Metal Detecting Forum. Going over the same dirt where I pulled a 1920 Merc, I came across a signal that was in the pulltab range with the smallest bleep of a high tone. 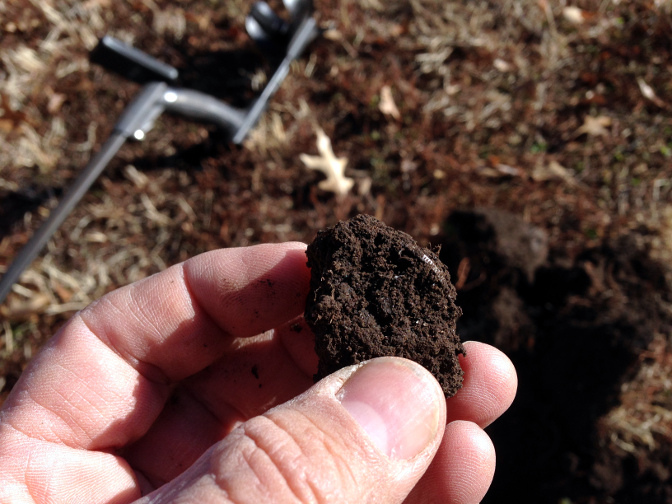 Since the soil at this site seems to be a bit strange, I decided to dig it. 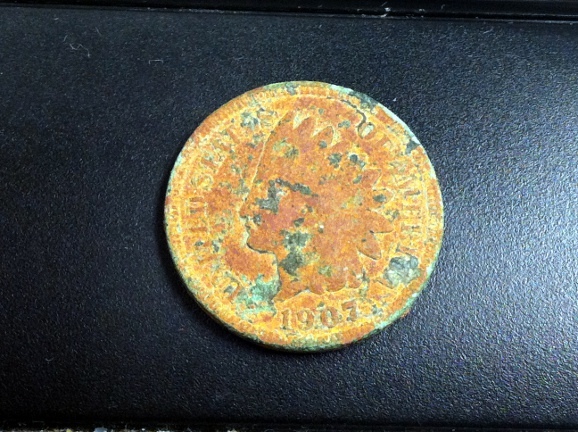 At about 5-6 inches, I found this 1907 Indian Head cent in kind of a corroded state. Not bad for hunting a spot that I’ve been over twice already. 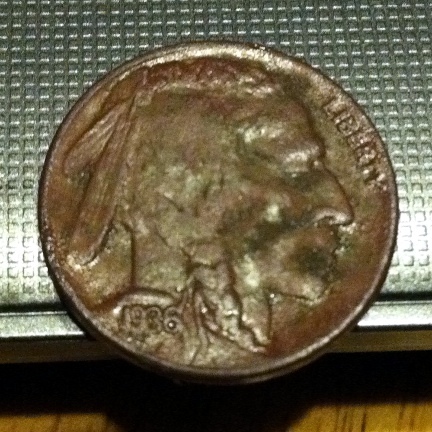 There is a high probability that this Indian Head cent has been in the ground for 100 years. The person who dropped this coin is probably dirt themselves by now. I continue to be impressed with my Deus. I even found this coin without headphones as I had forgotten them at home. I lost count of how many Indians I’ve found this year. I think maybe 10 or 12 now. All of them were found in Wichita. I wonder if I can find 10 indians for the year. Phew! I thought I was going to go all through 2012 without finding a Barber coin. Luckily, the XP Deus metal detector is a monster in iron. I returned for an hour to the 100 year old school that I hunted yesterday and was able to pull a trade token and an 1897 Barber quarter. 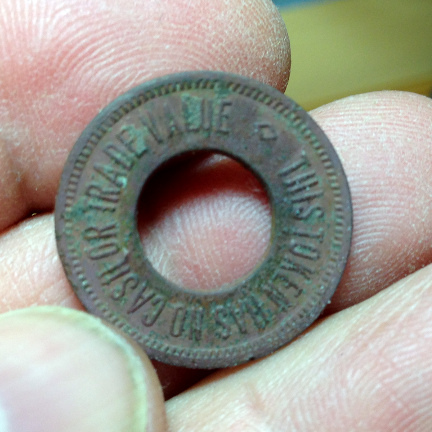 The token is about the size of a U.S. nickel and thanks to Steveouke, I know that it was made by a company called Mills between 1913 and 1932. The token was used in slot machines that were designed to prove that the machines themselves were not gambling machines! They did this by telling the gambler (gamer?) how many coins he or she would win on the next spin. If the number shown was zero, then you would put your coin in anyway because the next number shown could be something other than zero. The machines also dispensed gum for your coin, thus making the machine a combination of vending and gambling machine. Interesting to say the least. The Barber quarter gave a dime signal. I wonder if the reason for that is that the quarter is very worn. The coin was about 5 inches deep. Although the spot where I found these two (and the 1881 Indian Head and 1920 Merc yesterday) is iron infested, the Deus was able to pick up their signal nice and clear. I think I will hit it one more time before I move on to my other spot where I think I will find silver.